Just in time for this fall’s twenty-second edition of the Barnstorm workshop, photographers finally have a collection of Eddie Adams’s most potent work in one volume. 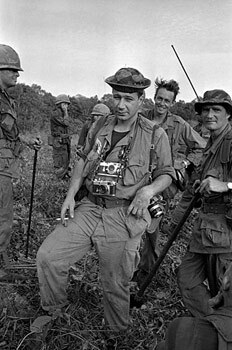 In Eddie Adams: Vietnam photographers have a chance to know the guy and get to learn how he made some of his most impactful pictures. Workshop participants—and the rest of us—can check out Adams’ work before they head to The Farm. For Adams, Vietnam was a start into the world of covering major news overseas. One might say it was here he learned to become a complete photographer. In the process he became a complete person. Not to suggest Adams was a saint in every moment. Photographers can see how he blended his qualities as a tough, competitive SOB with the wisdom to take things down a notch and chill when that was necessary. There are some of the very funny stories about the guy, and some of the grittiest pictures from the battlefront. He showed us war is a nasty business. In bringing this book together, Alyssa Adams, Hal Buell and others have delved into the journal Adams kept as well as the articles he wrote for the Associated Press while in Vietnam. We get access to Adams’ thoughts and to his humor. The private walked over to the poncho-covered bodies. He uncovered the face of one, knelt and touched the crucifix hanging from the neck to the lips of the dead man. Then he put the poncho back in place, got to his feet and kicked bitterly at the dirt as he walked away. Most important, Adams knew the impact a picture could have. 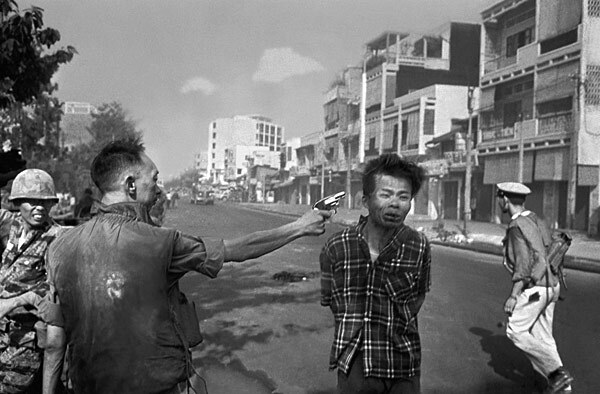 He did not like to talk casually about his Pulitzer Prize winning picture. He insisted two lives were lost the day that picture was made, the second being the general who fired the shot. Though the general was later admitted to the U.S., he was hounded for what he had done until he died several years later. This same sensitivity once prevented Adams from photographing a very frightened soldier under fire. Adams realized the fear he saw in the soldier, while dramatic, was most likely a mirror image of what Adams was feeling. Later this understanding of the power of pictures also prevented Adams from allowing pictures to be taken at a Halloween party when a well-known U.S. Senator showed up in blackface dressed as Don King. Adams knew if pictures were made, they would get out. If they did, the impact on the less-than-sensitive senator’s career would be devastating. Finally there is a chapter devoted to one of the lesser known but exceptionally important stories of Adams’ career, the 1977 coverage of the boat people. He called it, “The Boat of No Smiles.” While this eventually became widely known and lead to 200,000 Vietnamese being admitted to the U.S., it was essentially Adams’ pictures that first brought attention to these refugees from Vietnam who were not being allowed ashore in Thailand. If a boat landed, police just towed it back out to sea. Adams joined one of these fishing vessels and made pictures until Thai police returned and ordered him off the boat. And while Adams left a considerable photographic legacy, he is to be appreciated for creating the Eddie Adams Workshop for emerging photographers. While Adams may not have had a hand up at the start of his career, the annual fall event and the accessibility he gave to hundreds of Workshop photographers are his best legacy.